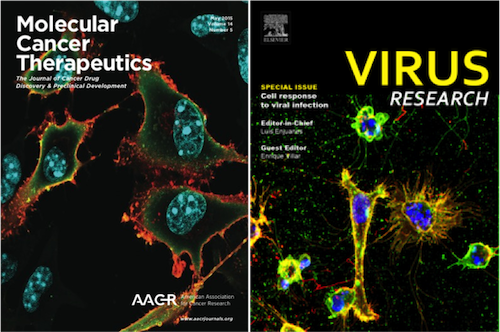 The cover images show murine B16-F10 melanoma (Mol Cancer Ther., left) and human HeLa cells (Virus Res., right) infected by the recombinant rNDV-B1/Fas virus undergoing apoptotic cell death. The human Fas receptor (red) is expressed on the surface of infected cells (green). DNA was counterstained with Hoechst. For details, see Cuadrado-Castano et al.,[Mol Cancer Ther 14(5), 1247-1258] and Cuadrado-Castano et al.,[Virus research; July 2015] . For more than a decade, our lab has been interested in the study and development of new viral therapeutics to fight cancer using the nonhuman pathogen Newcastle disease virus (NDV) as a model. We have investigated NDV’s oncolytic capacity in different in vivo murine tumor models (melanoma, colon carcinoma, lung carcinoma or lymphoma). These results helped us improve its natural therapeutic potential by generating new genetically engineered recombinant virus. Today, our research on cancer virotherapy is a multidisciplinary program that combines different scientific disciplines including molecular virology, molecular and cell biology, genetics and immunology. With a strong focus on in vivo cancer therapy, our studies help us to understand the interplay between virus, tumor and immune response and design better viral immunotherapeutic strategies to translate into the clinics. Transcriptome Analysis of Infected and Bystander Type 2 Alveolar Epithelial Cells during Influenza A Virus Infection Reveals In Vivo Wnt Pathway Downregulation. Click here to view a calendar with upcoming events.